Taking a cue from Lincoln’s historic connections with the Magna Carta and the Charter of the Forest and working with young people from The Meadows Primary School, Ruth Ewan created a reimagined globe responding to the continuity of ideas put forward via these historic charters. Through a series of close workshops with the artist, young people articulated their own demands of their world. Through collaborative writing and drawing exercises they imagined places they want to see and laws they want to live by. These workshops resulted in a series of slogans, text works and drawn maps. Selected words and slogans from the workshops feature in a series of letterpress prints produced with Lincoln’s Caseroom Press. One of the reimagined maps has been developed by Ewan and expertly crafted into an alternative globe by Greaves and Thomas. 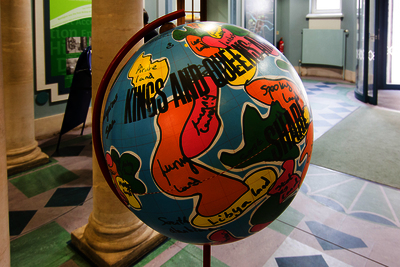 The globe was displayed in the foyer of the Lincoln Central Library, and launched on 15th June, the anniversary of the signing of Magna Carta. 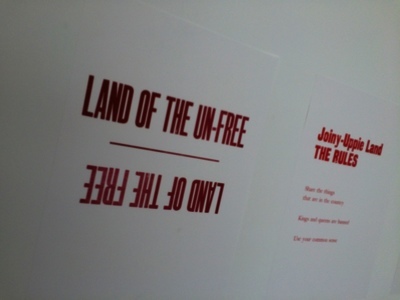 A text was written in response to the project by Alec Finlay and the slogans were exhibited at the Project Space Plus, University of Lincoln.